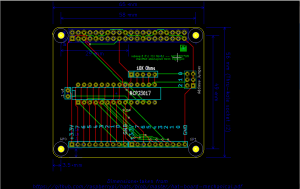 This is a circuit board to for an add-on board for a Raspberry Pi B+ that will add 16 3V GPIO pins, using a MCP23017 I2C I/O expander. 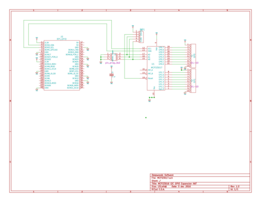 There is a jumper header to set one of eight addresses for the MCP23017 chip. This allows using more than one of this board or any other board featuring a MCP23008 or MCP23016 or MCP23017 chip (up to eight total). 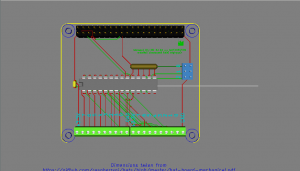 This circuit uses a MCP23017 to expand the Raspberry Pis I/O to 16 additional I/O pins. The 16 3V logic pins are simply brought out to screw terminals, along with the 3V and ground connections (useful for logic reference). Board assembly is straight forward. You need to be careful orienting the IC. Also the SIP resistor array needs to be carefully oriented — the dot marks pin 1, which is indicated on the board with a square pad. Full design information is available on GitHub here: https://github.com/RobertPHeller/RPi-RRCircuits/tree/master/MCP23017Hat. This board is supported by the Model Railroad System OpenLCB_PiMCP23017 and OpenLCB_PiMCP23017_signal daemons. A basic XML file for it is included in its GitHub folder. This board is available on E-Bay at http://www.ebay.com/itm/132601794568?ssPageName=STRK:MESELX:IT&_trksid=p3984.m1558.l2649.